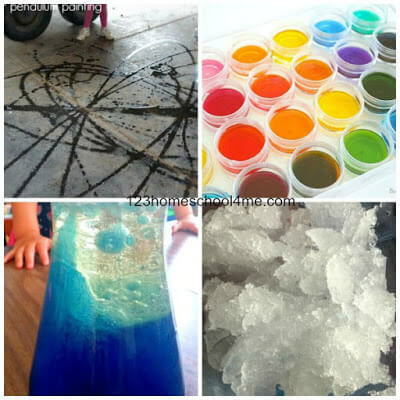 Get ready to have some outrageously fun, educational summer with these 60 unique Fun Activities for Water STEM of all ages. Water STEM is always a hit with students, and the warmer weather provides a great opportunity to learn without worrying about getting wet. 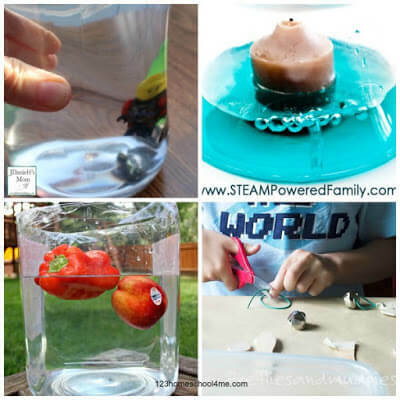 Whether you’re looking for way to stop the summer slide or you want to continue with science studies at the elementary, middle or high school level, there is a water STEM activity here for your child! Many of these awesome learning activities were presented as “boredom busters”, and they’ll definitely work for that purpose. However, I have provided a few extra ideas to round out your lesson plans and help you make the most of every learning opportunity this summer. 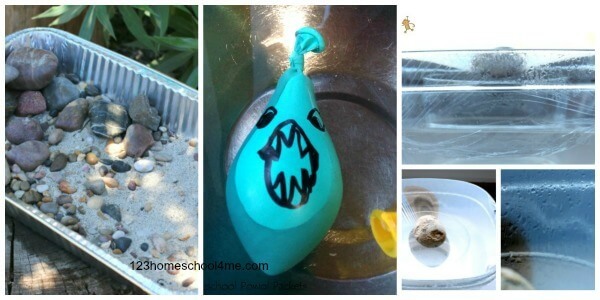 Assign your child to build a diver in a bottle following one of the examples below. Once your child has successfully built the demonstration, ask her to draw a force diagram that accurately reflects each situation. Any of the following engineering challenges could be made into a great lesson for older elementary students. Have your child draw up a “proposal” for how they intend to solve the problem. 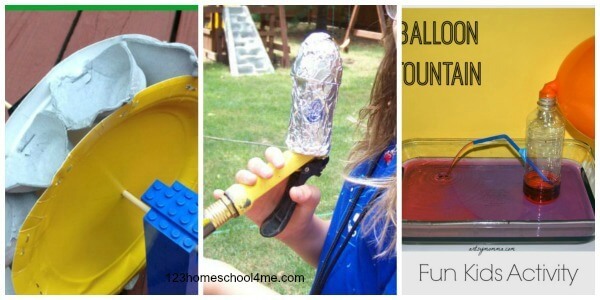 Have your child complete the engineering project. Write a report about their experience and justify any differences between their proposal and reality. Grade level: Advanced middle school, or high school. Ask your child to do the activity using the direction given. Ask your child to draw a force diagram of each situation in the activity. 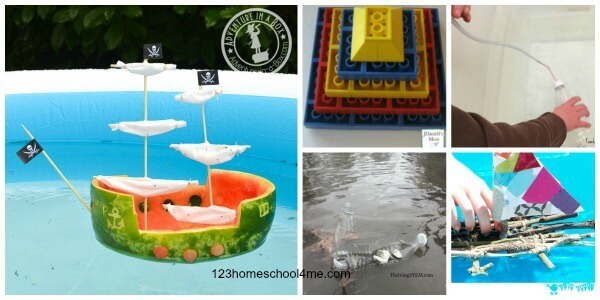 Assign your child to make a boat and successfully float it. Ask your child to write a fictional story about who might have made such a boat, and why. Water refraction from What do we do all day? Read an explanation from your science book, or from the posts themselves. Use the charts provide in this Wikipedia article on color to form a hypothesis about which color will be on the inside of the rainbow. We know light bends in water, so which colors will be most susceptible to bending? 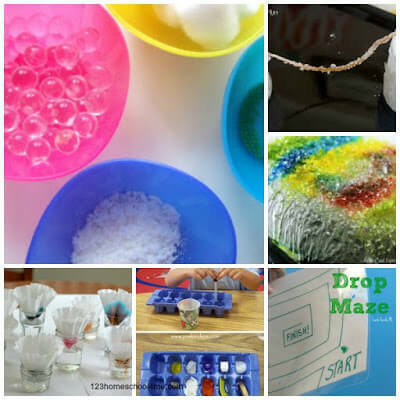 Put on your bathing suits, check your hypothesis, and do the run down the rainbow activity. Grade level: Middle school or secondary chemistry students. Provide a bin of loose parts including pom-poms, string, tooth picks, paper clips, small magnets, glue and putty. Ask your student to perform the following demonstrations. 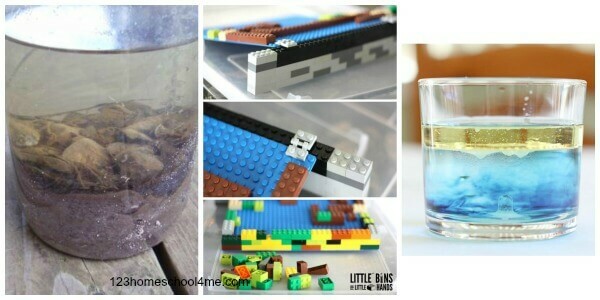 then use the loose parts to build a model of what the water molecules are doing in each. Read one or more of Susan Tate’s books about Ocean Animals. Draw a poster of an Ocean or Bay and include five animals living in their homes. 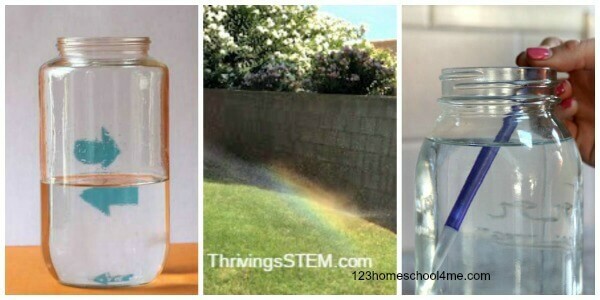 Make a tornado in a bottle. Talk about how and why tornadoes form. Describe a storm heads for your area. Do the shelter challenge. Imagine that a storm has destroyed your water supply. How can you conserve resources? Talk about the fact that water is a resource that needs to be conserved every day and try to teeth brushing challenge from Rainy Day Mom. Perform one or more of the following demonstrations. Create a small pond in a bin or sand box.Include dirt or sand. Give your child the scenario that heavy rains have caused a river to overflow threatening a nearby town. Ask your child to write a report that addresses the following concerns. How can the town be protected? How can the water be cleaned? Draw a scale drawing for how to implement each idea. 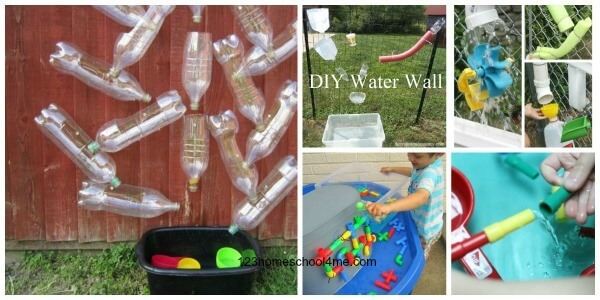 Water walls are the perfect tinkering opportunity for any age preschool through adult. For older children, challenge them to find the fast, slowest, and longest paths. Challenge them to make the most moving parts and the most interesting paths. 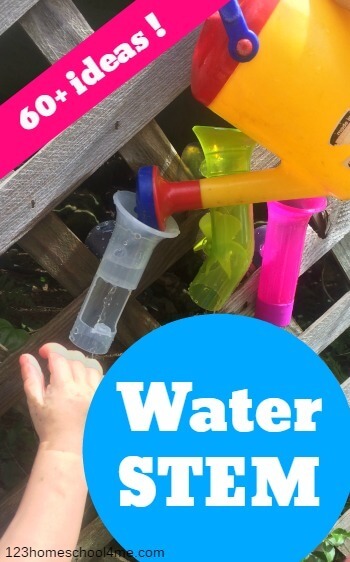 This last activity is an awesome idea, that didn’t fit with the other themes, but I plan to do with my own preschooler this summer as we’re working on learning to count. I hope you take the chance to experiment, get wet, and have a wonderful summer!